‘Cuprinol – It Does Exactly What It Says On The Tin’ – a now well known advertising slogan that can be equally as pertinent in real life. Describing how something doesn’t have to be complicated to work perfectly well and does the job that it was intended to. This could be as equally a relevant term when it comes to music too. If you want a band that plays a particular type of music exceedingly well without over-complicating things then there will always be one that fits the bill. If you’re want at ‘Medieval Space Rock’ (well, we all do at some point in our lives) then you need look no further than ‘your favourite time-travelling prog-warlocks’ (their words, not mine!) Gandalf’s Fist and their brand of Prog, Folk and Rock to get what you need. 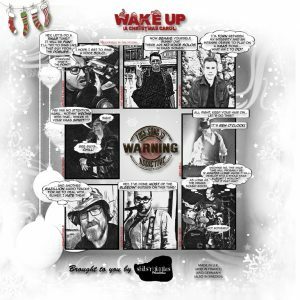 This year has seen the band embark on a through revamp of 2013’s space-rock offering ‘A Day In The Life Of A universal Wanderer’. The expanded album has been fully remixed and remastered from the ground up, utilizing new performance takes and bringing the release firmly in line with the sonic palette of 2014’s “A Forest of Fey” and 2016’s “The Clockwork Fable”. The record also features new and re-recorded narrative tracks from British Actor Mark Benton, who had previously worked with the band on last year’s Triple-CD album release. 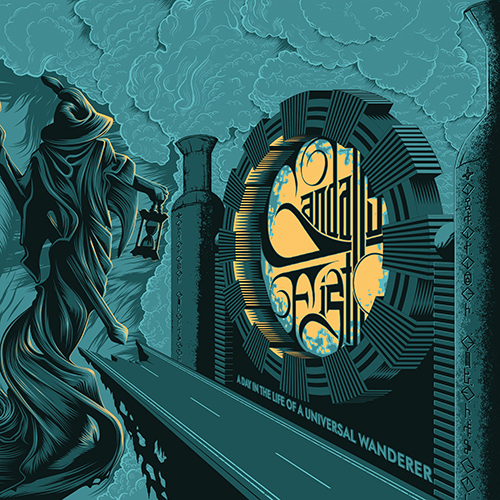 Completing the package is the brand new, exclusive track The Stowaway and the Endless Night, an 11 minute opus originally omitted from the original release, as well as brand new cover art commissioned from German artist Thomas Huth, the man reasonable for the band’s sleeves on the last two releases. What Gandalf’s Fist have always been is brilliant storytellers, the duo of Dean Marsh and Luke Severn (now with the added teutonic skills of Stefan) have always been able to weave involving tales and set them to outstanding music and this revamped version of ‘A Day In The Life Of A Universal Wanderer’ is no exception. The opening Another Night On The Far Side Of The Universe sees the ship’s computer (voiced by Alicia Marsh) and the instantly recognisable dulcet tones of Mark Benton as The Captain, set the scene for the universal journey ahead. The Nine Billion Names Of God is a darkly bombastic track with doom-laden vocals and a slow metronomic beat that really gets under your skin. With a sound deeply rooted in early 70’s sci-fi it is eerie and disturbingly atmospheric and the chorus is an unexpected ear-worm that you find yourself singing in the most inappropriate places (like Church for instance!). Add in some ethereal flute, moody saxophone and some great twin-guitar work and you have a great start to the album. The next scene-setting interlude, Where’s A Bloody Escape Pod When You Need One?, segues straight into the powerful opening of Stowaway To The Mushroom Planet before things roll back into some seriously chilled space-rock with delightful female vocals. A serenity falls on the music, only broken by the superb melodramatic chorus, this is rather a fine track which is only enhanced by the excellent guitar solo. There’s a pleading Message Home delivered in a disconcerting manner and then then wonderful Melissa Hollick arrives to deliver a wonderfully emotive vocal performance on the grandiosely anthemic Somewhere Beyond The Stars. Along with the utterly captivating piano, Melissa’s vocals entrance and captivate to leave you utterly bewitched. It’s as good a piece of music that you will hear this year and always brings a lump to my throat and a moistening to the eyes, just listen to the enchanting guitar playing and you’ll know what I mean! Seriously heavy space-rock infused prog makes an appearance on the mighty Orphans Of The Sky, a lengthy and intricate homage to the 70’s heavy rock acts. A slow-burning verse erupts into the monstrous chorus with no apology and delivers a powerful and compelling performance with the measured riff and dynamic drums adding to the forceful vocals. The spacey, far out guitar that plays across your mind before the track breaks back into the chorus is pure genius. The alien A Visitation Of The Mushroom People leads the way into the forgotten opus The Stowaway And The Endless Night, omitted from the original 2013 release. A seriously intensive and inventive 11-minutes plus of progressive rock that builds its atmosphere slowly with some rather fine guitar and drums grabbing and holding your attention before a menacing voice over intrudes. All hell breaks lose with a twin guitar riff of monlithic proportions. The song ebbs and flows with some superlative and convoluted music and some excellent vocals, the female voice again supplied by the sublime Melissa Hollick. The band will have their reasons for not including this track on the original release but I do wonder why as I think it is rather good and fits in with the rest of the songs perfectly. Universal Wanderer is a great space-rock track that takes the listener on a wandering journey through space and time in their own mind. The song seems to bubble under for a while with barely suppressed urgency before a superb riff flares up and gives real potency to the hard-rock feel. The guitar sound lends itself to 80’s heavy metal and the whole song just rocks mightily. There’s a more measured approach with Nexus, a thoughtful song with almost a folk edge to the vocals and guitar. You feel you are involved in something mysterious and perplexing as this pensive track continues. The keyboard and guitar break in the middle of the track really feels like it could be on a Wings album with its high spirited creativity, throw in the moody sax and you have a really mind opening piece of music. Wistful and nostalgic, North of Wall puts breathy vocals and laid back instrumentation to good use to give something almost Celtic in flavour. The voice-over tells an involving tale before the song segues straight into the whimsical brilliance of The Battle for Tannhäuser Gate. Violins, cello and the beauty of the female vocals bring to mind heroic tales sung in medieval times, “I will die in my boots..”, songs sung of great battles and comrades lost and this gives a melancholic atmosphere to everything. There’s also a Celtic influence to the song and it works superbly, the guitar solo fits perfectly into the song and I can imagine myself sat round a roaring fire in a village tavern, seduced by the music and the beauty of the voices. Ghosts of Spacetime sees The Captain bring the whole storyline together and it’s a credit to the vocal talents of Mark Benton that you are left hanging on every prophetic word before the spell is broken by the opening bars of the final track The Wanderer Goes South. Some exquisite flute work gives added gloss and sheen to another great piece of Gandalf’s Fist music. In the background there’s a reprise of the guitar riff and beat from The Nine Billion Names Of God before Melissa’s great vocals begin again. 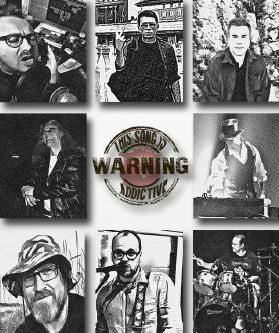 A song of space-rock whimsy that perfectly sums up what has gone on before, the songwriting skills of these excellent musicians are entirely evident as we are led along a twisting path of musical enigma. A brilliant guitar solo and the repeated mantra of ‘Nine Billion Names Of God’ close out the track and leave you smiling with appreciation. This is a collection of songs that you can lose yourself in and forget the worries that are glaringly evident in our everyday life. Superb musical escapism with a inventive storyline that you’ll keep returning to again and again. Cinematic in feel and scope my next question is, when will you be releasing the sequel? Cogtopolis – The city beneath the surface, no daylight has been seen by the inhabitants in living memory. The Sun: a whisper, a legend. For two hundred years tales have been passed down from father to son. Tales of mankind’s folly and technical abominations. Tales of the day clouds engulfed the sun. Tales of the twenty year winter and the slow, agonising death of “The Surface”. But the greatest tale of all was of mankind’s ultimate salvation within the warm, safe, belly of the earth…….. Ambition is something that should be encouraged, lauded even, especially if what it produces is something quite remarkable and unique. However, there is a small proviso, ambition is no good if it isn’t backed up with the necessary skill and intelligence, for what is ambition without intelligence but a bird without wings ( I sort of borrowed that last bit from Walter H. Cottingham but, if you don’t tell him, neither will I…). 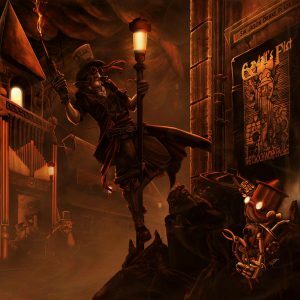 When Gandalf’s Fist announced that they were going to release a 3 CD Steampunk Concept album based in a world of their own creation I think quite a few people thought that they’d moved on from ambition into sheer madness and lunacy. 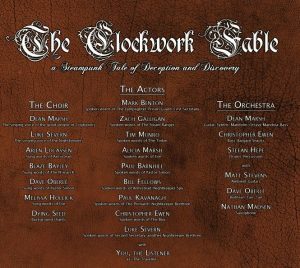 Would ‘The Clockwork Fable’ end up being a huge undertaking that could prove to be their undoing?, when I was sent this behemoth of musical enterprise I approached it with a lot of caution, not knowing what to expect and wondering if my friends had bitten off more than they could chew…. To be fair, three albums, thirty three tracks and over three hours long, it would tax even the most dedicated listener and, for me as a reviewer, would mean a complete sea change in how I would actually review this release. Normally, I do a track-by-track review which generally leads to something quite lengthy. How would I write about this complex undertaking so as not to leave my readers comatose and in a world of TLDR (Too Long, Didn’t Read – you can thank David Elliott for that acronym) and yet be able to really encompass the whole musical endeavour and give people a flavour of what it is all about? That conundrum has taxed me for the last couple of weeks while I have spent the time to immerse myself completely in the wonders of Cogtopolis and its many and varied residents. Imagine, if you will, the parallel universe whereby Monty Python were commissioned to write a Doctor Who-style period drama which was subsequently scored by an imaginary supergroup formed by members of Maiden and ELP and you’d get somewhere close to what Gandalf’s Fist have created with “The Clockwork Fable”. Originally formed in 2005 by Multi-Instrumentalist Dean Marsh and lyricist Luke Severn, Gandalf’s Fist draw on their mutual love for the ‘Golden Era’ of Progressive Rock, The New Wave of British Heavy Metal and even Renaissance Folk to create concept albums that are both nostalgically engaging and experimentally innovative in nature. Following the addition of drummer Stefan Hepe and bassist Chris Ewen for their last album, the acclaimed ‘Forest of Fey’, ‘The Clockwork Fable’ is their second release as a four piece. 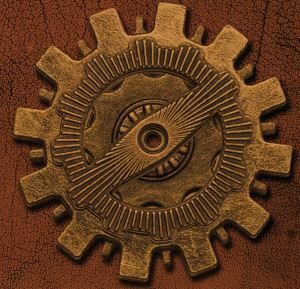 Let’s start with my thoughts about what ‘The Clockwork Fable’ actually is. It is a huge project to get your head around, in no way a mere CD or album, it is progressive rock as musical theatre. Imagine, if you will, the sinister, yet childlike, humour of ‘Chitty Chitty Bang Bang’ set in steampunk universe that has come straight from the mind of ‘His Dark Materials’ author Philip Pullman and you are still only scratching the surface of this epic labour of love. 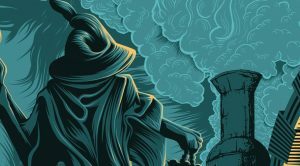 It almost feels like it was written for the stage or screen with a darkly humerous script provided by the likes of Neil Gaiman or the recently departed Sir Terry Pratchett and then delivered in a kind of ‘War Of The Worlds’ fashion. The band’s imagination holds no bounds as they have meticulously created the world of Cogtopolis, its residents going about their daily business in the three huge, interconnecting caverns of this subterranean city, Ardel, Cartoe and Porfan with their unique cultures and denizens. It is a world that has been conceived down to the minutest detail, hierarchy of the society, religions and even their own ‘alphabet of the underworld’. 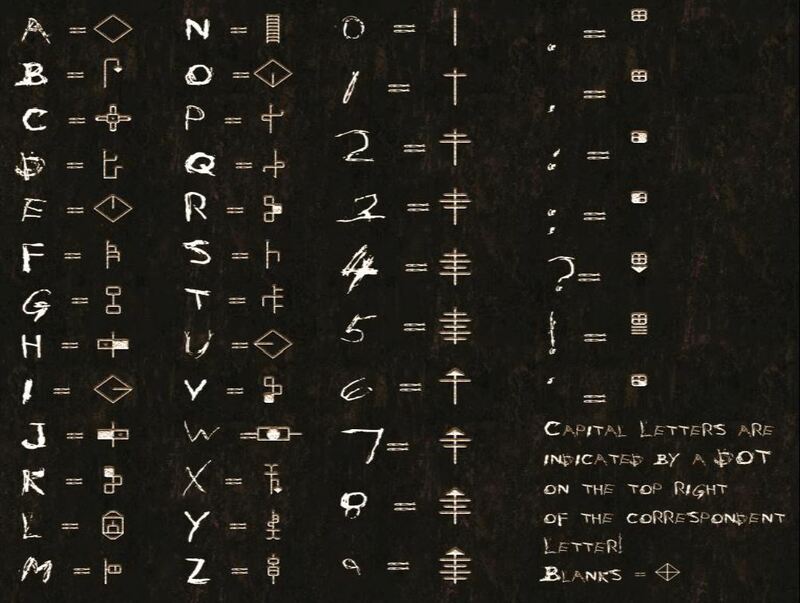 With Braille and Morse Code among the many strands of knowledge and learning lost amidst theobliterated libraries of the surface, the industrious scholars of Cogtopolis devised Cypheridia. 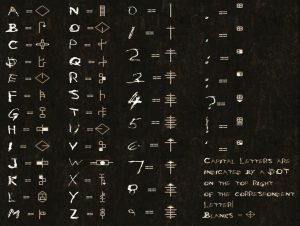 A new, basic way of writing that could be scratched into metal surfaces with ease, or – for the brass-bound worker – etched into the mud of the cavern floor at the very least. From this detailed and precisely constructed world emerge a cast of characters brought to life by a fantastic cast including Mark Benton, Zach Galligan, Bill Fellows and Alicia Marsh, to name a few. In fact, it was Mark himself who put the effort in to get the majority of the crew together. Between them they bring the richly envisioned world of Cogtopolis and its inhabitants to life. At its heart, it is a story of the age long struggle between light and the dark. An utterly spellbinding tale brought to life by the fantastic cast of voice actors. A suppressed populace labouring under a misheld belief that they will never see the light again. My fellow scribe Phil Lively, correctly, pointed out that it is the fight of the heroic northerners against the evil cockneys and Mark Benton’s jolly lamplighter is the first character we encounter. 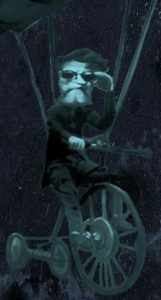 Living a lifetime among the bowels of Cogtopolis, scurrying tirelessly amidst the endless streets of derelict machinery, he has, man and boy, lit every lamp in the city beneath the surface. It is a tale that we have heard many times before but we never grow tired of and, in this incarnation, you find yourself rapt as the establishment refuse to believe that the sun has returned to the surface, wanting to keep their citizens subjugated. The Tinker and his assistant Eve are the hero and heroine of the tale, trying to repair the mechanism that will return sunlight to Cogtopolis and hounded by The Primarch and his cronies at every turn. Woven perfectly between the voice acting is an incredible music backdrop that blends with the storyline to create an amazing musical experience. 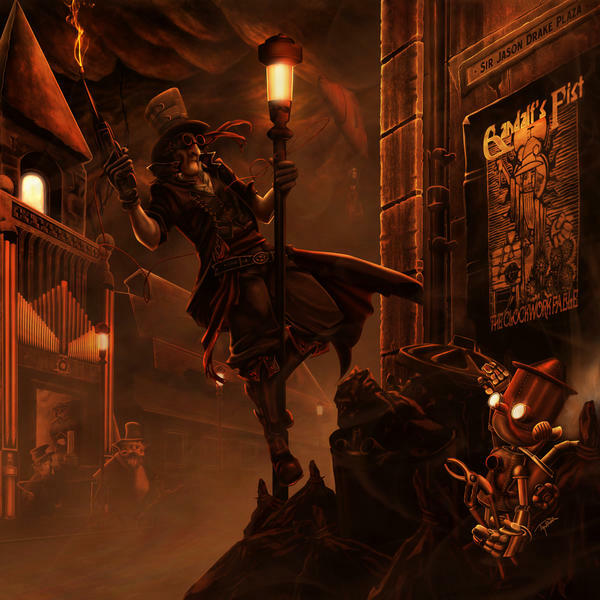 The talented Arjen Lucassen, Blaze Bayley and Matt Stevens all add their considerable musical weight to ‘The Clockwork Fable’ to create something fantastical. Melissa Hollick returns for the third album in a row, this time as the singing voice of Eve and you can hear her dulcet tones lighting up Shadowborn with it’s ‘female-fronted metal’ feel. What you have here are accomplished musicians who can turn their skills to virtually any musical style with aplomb. 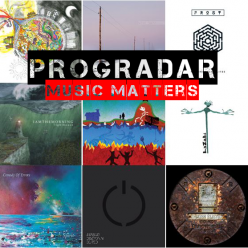 On the three epic Lamplighter tracks (one for each disc) we get proper, intricate progressive rock delivered expertly, each track a musical journey in its own right. Eve’s Song is a delicate track of ethereal beauty where Melissa gives a delightful vocal performance that just leaves you open mouthed with admiration. The acoustic guitar the is prevalent throughout Victims Of The Light gives it a real feel of Richie Blackmore in his folk mindset before exploding into something from Neal Morse era Spocks Beard. A particular favourite is the brilliant Ditchwater Daisies, a complex and involving track that enthralls from beginning to end. There is a touch of Pink Floyd to this song, in my opinion, thoughtful and nostalgic. A touch of early Genesis? That will be The Bewildering Conscience Of A Clockwork Child and A Solemn Toast For The Steam Ranger Reborn. What you do get is the thought that every note is there for a reason, to tell more of this extraordinary tale, none of it is superfluous or gratuitous. The music blends seamlessly with the voice acting to enhance the story and give it added layers of meaning. The Climb is a song that mixes the intricate with the dreamlike leaving you hanging on every word and note. These guys have the ability to draw you into their tale and making you feel like you belong there and it is the incisive and intelligent songwriting and voice script that is primary in their ability to do this. I’d been waiting for a bit of a metal track and Fight For The Light gives you that with its symphonic power and tasteful vocals. There is a guitar section in here which could come from an early Maiden album and it just put a huge grin on my face. The final track that really stood out for me was the title track. 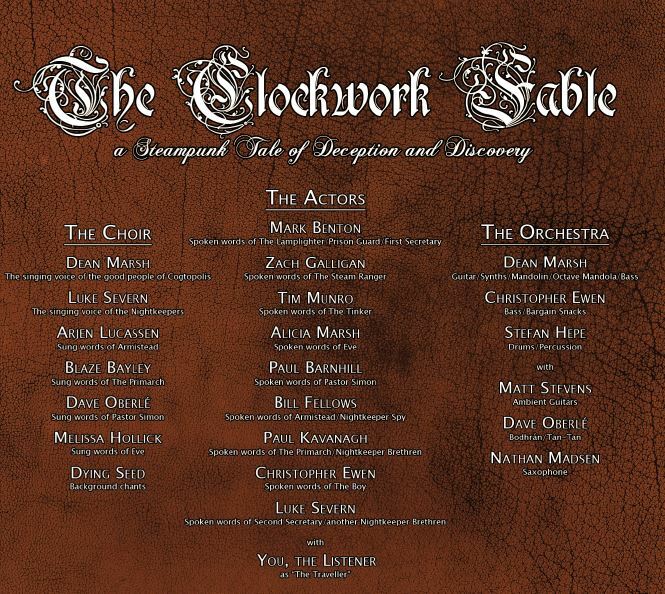 The Clockwork Fable is a heartfelt, fervent and wistful song that just grabs at your heartstrings and leaves an indelible impression, just beautiful. And, well, The Lens, is that a tear in my eye? I’m not saying – Oh Bugger! So, do the citizens of Cogtopolis escape the dark underworld, do The Tinker and Eve repair the cog mechanism of The Aperture, despite the attentions of The Primarch and his allies, to finally return sunlight to the murky lives that they are forced to live? Don’t ask me, buy the album and find out what happens in this utterly captivating story yourselves. 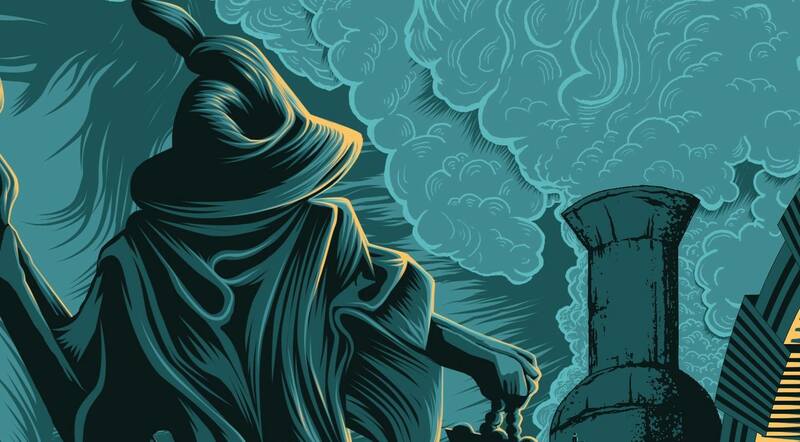 Gandalf’s Fist have delivered a mesmerising musical masterpiece epic in scope and utterly breathtaking in its delivery. It’s length may deter you from listening but, believe me, you are missing something quite exceptional and utterly marvelous. This is not just piece of music, it is a wholly engrossing experience that will make your life richer for having taken part.